Issue: I ran a block session, but now sites are still blocked even after the session has ended. What can I do to fix this? 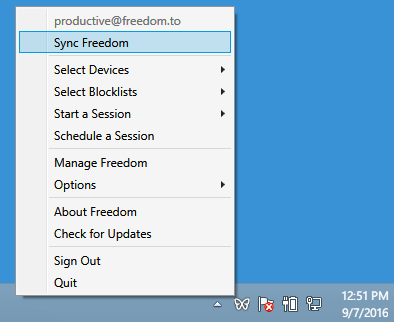 Log out of your Freedom Desktop Client by selecting "Sign out"
Quit the Freedom Desktop Client by selecting "Quit"
Start the Freedom Desktop Client and log back in. 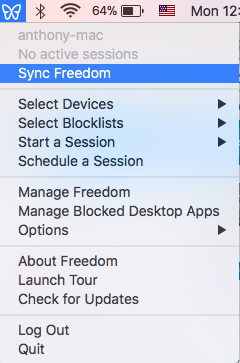 Freedom uses an on-device proxy to block the sites you've selected. If you run into a problem with the Proxy, you can disable it by going to System Preferences -> Network -> Advanced -> Proxies and de-selecting Web Proxy and Secure Web Proxy. Here's a screencast of the steps. If worst comes to worst, we'll delete and reinstall the device following these steps. Log into your Freedom dashboard and delete the device.